As 2017 draws to a close, we look back at 5 trends that have defined M&A activity over the last 12 months. Rapid consumer change gives way to buy and build M&A in the sector. M&A in the Consumer sector has hit its second highest value since the financial crisis as a result of changing technology and consumer habits. The industry has seen a 65.7% increase by value compared to 2016. Indicative of this was Amazon’s $13.7bn spend on Whole Foods in August which was another example where it became quicker, easier and eventually more cost-effective to buy than build when jumping over such high barriers of entry. Chinese bids for European & US targets fall off a cliff. China’s aggressive pursuit of American and European targets hit the buffers in 2017, following increased regulations in China, Europe and the US. Deal value fell from 2016’s record figure of $149.7bn across 228 deals to just $52.5bn across 170 deals seen during 2017 as a result of protectionist regulations from the Chinese government, European Union and President Trump’s administration. Elizabeth Lim, Research Editor (Americas) at Mergermarket: “Chinese buyers, disinclined to be labelled national security risks, have begun pulling back in the US and Europe following record outbound M&A activity in 2016 and blocks by regulatory bodies such as CFIUS this past year. However, the fact remains that Chinese capital is still seeking targets; the question now is where those might next be." Eurozone recovery leads to an uptick, as Brexit encourages British corporates to seek consolidation. Europe has seen a boost in dealmaking in 2017, with the continent accounting for 28.9% of global activity year-to-date – its highest contribution since 2013. Much of this can be attributed to stronger economic figures across the Eurozone, which have resulted in a surge in M&A in the bloc in 2017. Meanwhile, as has been the case for the past 18 months, uncertainty surrounding Brexit has again been instrumental behind UK M&A. A weaker sterling has continued to push bargain hunters the UK’s way; while British corporates have sought domestic targets in an attempt to bat off cherry-picking predators in the form of Standard Life’s £1.8bn takeover of Aberdeen Asset Management and Tesco buying Booker. December storms ahead, but a volatile 11 months has left 2017 playing catch-up. 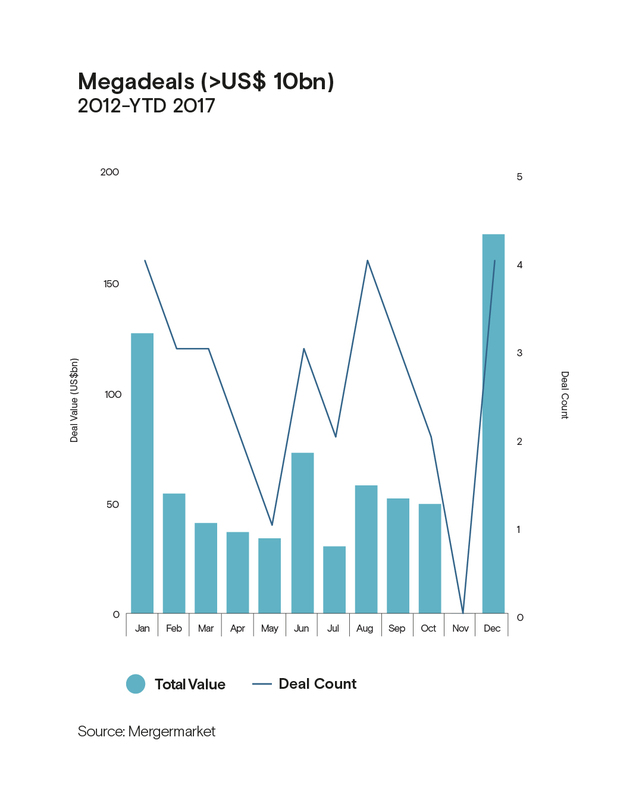 December has seen a clear uptick in megadeals, with two of the largest deals of the year occurring this month including Fox and Disney’s announcement that they will embark on a $66bn tie-up not only added to the end-of-year flourish in December, but is also a fitting example of much that has driven 2017 M&A activity. 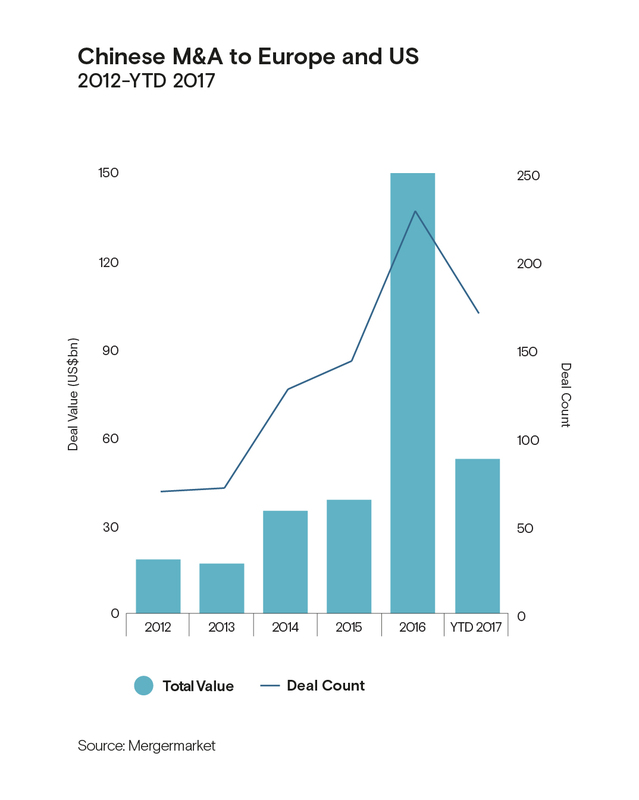 The deal pushed this year’s lagging global M&A figures to $2.99tn across 17,455 deals, yet still appears set to fall short of last year’s full year $3.26tn secured over 18,592 deals. Cross-border M&A reaches new heights as dealmakers spread risk through consolidation. Cross-border activity has once again been a key component of M&A in 2017, despite seeing a clear reduction in the number and value of such deals. In 2017, there were 6,136 cross-border deals worth US$ 1.27tn, a 4.7% drop compared to 2016 (US$ 1.33tn). However, while cross-border M&A has reduced in terms of raw numbers, its share as a percentage of global M&A in 2017 stood at 42.6% by value, the highest since 2014 and 35.2% by deal count, the highest such figure since 2011. As confidence wanes in various regions it appears that dealmakers are pursuing a strategy of spreading risk, over consolidating within home markets. For more information, email trial@acuris.com.